“Social commerce is on the rise. More and more brands are looking to reach their core audiences in digital arenas where they live rather than through traditional means. Creating a shoppable Instagram enables brands to convert growing social engagement into website traffic and sales. Bridging this gap between social content and the path to purchase is essential for brands looking to capitalize on this social engagement. Magento customers are using Pixlee’s Shoppable Instagram to drive sales and traffic directly to product pages. According to a report published earlier this year, 30 percent of Millennials engage with a brand on social at least once a month. Similarly, 62 percent of millennials say that if a brand engages with them on social networks, they are more likely to become a loyal customer. With massive Instagram adoption among this group, brands already see tremendous value in using their Instagram as an engaging and profitable social storefront. 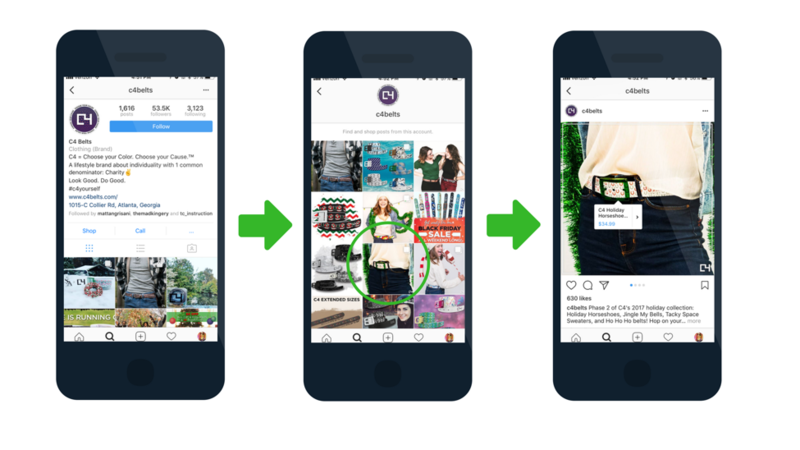 Pixlee's Shoppable Instagram solution creates a seamless flow of content from social media to a brand’s eCommerce website. Pixlee makes it easy to leverage the vast amounts of social content being created by consumers, and the influencers they follow, to drive engagement and sales. On average, brands using Pixlee’s shoppable galleries see an increase of 6 percent in AOV and a 22 percent average increase in Product Detail Page (PDP) traffic. Pixlee’s out-of-the-box solution enables brands to get their shoppable galleries up and running in 30 minutes without developer resources. Another great feature is the Instagram Scheduler tool, which lets brands schedule posts to go live at an exact moment, increasing engagement, clicks, and sales. Keeping gallery content fresh not only saves time and money, but it’s proven to increase performance. “As the number of monthly active users on Instagram soars, we’re seeing a clear shift towards visual content among consumers. Sixty-five percent of top Instagram posts display products for purchase, and 33 percent of Instagram users report that they’ve purchased items they first saw on the platform. This means that social channels — especially visual ones, like Instagram and Pinterest — are becoming new centers of commerce. One of the elements that makes Instagram so effective as a medium for product discovery is the popularity of user-generated content. Brands that use Instagram to market products often opt for sharing genuine customer photos that reveal real-life product experiences, creating social proof and building trust. This push towards customer-generated content reflects shopper preferences: 77 percent of user-generated photos result in a higher conversion rate compared with professional photos. Instagram quickly recognized the enormous potential of these authentic images for the commerce industry. The platform has started a rolling release of their new ‘Shopping on Instagram’ feature, which allows brands to list products directly on their feed with links to their site for instant purchase. As social continues to disrupt the retail experience, savvy brands are keeping up with the challenges by building a visually driven on-site journey, and by collecting and leveraging customer content. One of those brands, Green People, has both a Shoppable Instagram feed and an Instagram-inspired experience on site. Their shoppable gallery on their homepage, “Loved on Instagram,” is filled with customer product photos, each linking to the relevant product page, where even more customer photos are displayed alongside reviews for maximum visual and textual impact. 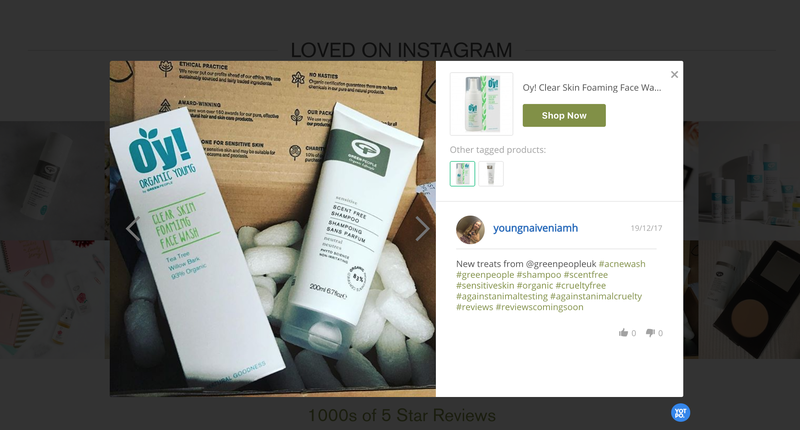 A customer photo on Green People’s curated homepage gallery. Green People set that cycle into motion by including a call for review and photo submissions as part of their homepage gallery. They urge customers to share content on Instagram using the branded hashtag #GPturns20, and incentivizes users with the chance to win a voucher in a monthly draw. Find out more about Yotpo's shoppable Instagram at Yotpo.com. There’s no denying the increasing popularity of Instagram, which now attracts over 800 million monthly active users up 25 percent from the prior year. The social platform has successfully transformed itself from being recognized as not only a photo social media network, but a highly important marketing channel for eCommerce brands of all shapes and sizes. Style and Launch Your Instagram Landing Page: Springbot allows you to easily design your Instagram landing page to match your store’s brand look and feel with your very own customized shoppable gallery. You can launch this feature without any development resources (yep, no coding needed). Springbot’s Shoppable Instagram can be up and running in a short amount of time (think hours, not weeks). It’s that easy. Set up Automated Triggered Emails: Through Springbot’s app, you can send automated emails specific to your Instagram followers that remind them to come back and shop later. Triggered emails can also be sent to customers who want to be reminded about certain products they saw or liked on Instagram. Track and Monitor Performance: With your Shoppable Instagram landing page up and running, you'll want to track your clicks, orders, revenue, average order value (AOV), and return on investment (ROI). You’ll also see the exact orders that came in through these actions, who made purchases, the most popular products, and top referring URLs. You can find these Instagram solutions and many other visual marketing solutions at the Magento Marketplace.